From the moment I found out I was pregnant, I immediately started brainstorming ideas for the nursery and I knew I wanted it to be a break from the norm of pastels and traditional 'baby' decor. I also knew I wanted to make the room highly personalized with tons of do-it-yourself projects, just to satisfy my creative side. It all began with my love affair for the Ikea Strib rug and then continued with my paint color choice of 'Rushing Stream' by Valspar. After that, I decided my 'theme' would be all bright colors focusing on aqua, lime green, and orange. My talented Mom made all of the curtains, window seat cushion, and rocker cushions for the room while myself and my mother-in-law sewed the bedding. We also indulged our love for fabric patterns by making our pennant banners around the whole room and an adorable birdie mobile above the crib. I used Photoshop to create multiple personalized prints with Truman's name, pictures of his family, and quotes for our baby boy. After numerous baby showers, we ended up with plenty of stuffed animals to decorate the nursery, and it seems giraffes, doggies, and monkeys are another theme of sorts. My favorite special project is the canvas art I painted for our little man, which includes his name, stick figures of his family, letters, numbers, and animal characters. I hope he loves it as much as I do! Besides loving the bright colors and personalized touches in the nursery, I also love that we did it all on a budget. Scouring Craigslist for gently used furniture and making our own fabric pieces really saved us a lot of money. 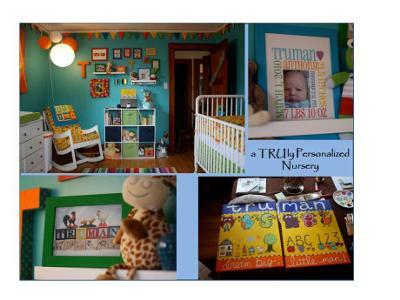 I don't think a cute, happy, personalized nursery needs to cost a fortune as long as you are willing to put a little work into it! Simply want to say your article is as surprising. The clarity in your post is just nice and i could assume you are an expert on this subject. Fine with your permission let me to grab your feed to keep up to date with forthcoming post. Thanks a million and please keep up the enjoyable work. What a happy room! I love the colors and all of the different fabrics. You can especially enjoy a room like this, knowing you didn't pay a fortune for it...and seeing the loving hand work done by mom and grandmoms! This room will certainly help nurture a happy and creative child. I'm very impressed! totally off the charts. baby will love the bright colors. very non-traditional. may start a new way of decorating a baby nursery. Smart mom. Fortunate babe. Thank you Julia for sharing such a wonderfully warm and loving nursery with us. Just goes to show that you do not have to spend a fortune to decorate your nursery. Also, as I have said before...if you put in things that you or other loved ones have personally created; you just cannot go wrong with the nursery decor. I enjoyed seeing all the pictures of your nursery on your blog 'My Life in Transition'. Join in and write your own page! It's easy to do. How? 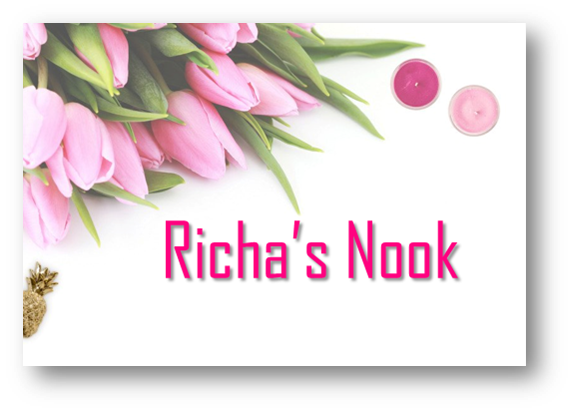 Simply click here to return to Your Gender Neutral Nursery 'Magazine Moment'.